Gib Leach, the first swimmer to be honored by the Hall, practically grew up in a pool and thrived on hard work. His prep career at Peoria Richwoods could hardly have been more successful. Going undefeated in dual meets from 1970 through 1972, Leach won the state 100 yard breaststroke in 1970 as a sophomore in 1:02.71 and lowered his state winning time to :59.940 in the event two years later, becoming only the sixth swimmer in national high school history to break the one minute barrier. He was a high school All-American for his final three seasons of prep competition, was ranked second in the nation in the 100 breaststroke his senior year and was voted Illinois High School swimmer of the year in 1972 by Illinois swimming coaches. 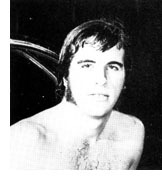 Away from the prep scene, Leach was a finalist in the 1971 Men's long course national and was ranked 14th in the nation in 1971, qualifying him for the 1972 Olympic trials.